Why the need for a more iterative product strategy? – Roman kicked off the course by talking about more traditional ways to formulate a product strategy. Traditionally, a company would do lots of market research upfront, spend a lot of time on a solid business case and then create a long-term product roadmap. The perceived benefits of this approach are a sense of risk management and a sense of thoroughness. I would argue that a long winded product strategy formulation process can result in a false sense of reassurance. Speed to market is key and I believe that most companies simply can’t afford to spend loads of time and effort doing upfront research or planning. Roman made the case for a much lighter process; a quicker way of assessing market/product opportunities and an iterative process of testing product assumptions. ‘Just enough market research’ – Instead of spending ages carrying out market research and analysis upfront, Roman talked about doing ‘just enough’ market research. When you apply a ‘lean’ approach of testing assumptions and hypothesis (see my earlier blog posts about assumptions here), you should do just enough market research to test any key risks or leap of faith assumptions. Product vision – A number of the course attendees were keen to find out more about how to best create a product vision. Roman explained the main function of a good product vision: to provide the “why”, the underlying motivation for a product that you’re looking to develop. What’s the impact or change that you’re looking to achieve and why? A business vision or product vision provides you with guidance, a continued purpose. We talked about the often misused lean concept of the “pivot” (a term coined by Eric Ries, founder of the Lean Startup movement). The idea is that when a company pivots, it means that it changes its approach or tactics whilst staying grounded in its vision. Roman then went on to talk about the characteristics of a good product vision and running a vision workshop (see Fig. 1 and Fig. 2 below). Product roadmap – Roman spent a good part of the course talking about the value of a good product roadmap, which was very helpful. 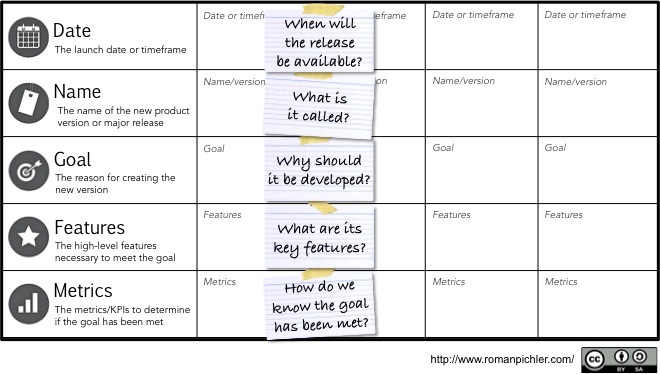 Prior to this course I had already used Roman’s template for a Goal Oriented Roadmap, which I’ve found to be a great tool for combining product strategy with specific business or product objectives (see Fig. 3 below). Roman explained that a product roadmap communicates how a product is likely to evolve over time. He suggested that the younger your product is, the shorter your roadmap horizon should be. For example, with young products, the time span of your product roadmap should be no more than 6-12 months. The other thing Roman mentioned, which I feel gets often overlooked, is that the creation of a roadmap is a collaborative process. One of the reasons why I particularly like the Goal Oriented Roadmap is that this template is very easy to extend to suit one’s specific purposes. For instance, if you’re looking to create a roadmap for a portfolio of products or for specific releases, then it’s easy to adjust the “GO” roadmap template accordingly (see Fig. 4 below). Main learning point: Roman’s Agile Product Strategy and Roadmap Course is great for anyone who wishes to learn more about more ‘holistic product thinking’; creating a product roadmap and being clear on why certain products/features are on the roadmap (and others aren’t). The key thing for me is Roman’s goal-oriented product roadmap, a great tool for combining product milestones with specific business goals. Think big – A good vision is lofty and aspirational. A shared vision – Create a common sense of purpose which is shared widely across the company. Motivating – Outlines the benefits that the product or service creates for others. Short and sweet – A good vision is easy to understand and to communicate. Use for decision-making – Use your vision as guide when making business or product decisions. Distinguish between vision and strategy – A vision should not be a plan that outlines how to reach a goal. Have a rough idea of the vision beforehand – As a product person, it’s important to already have an idea of the what the initial product vision and direction should like like. This will help in facilitating the workshop. Listen, but don’t end up making weak compromises – Especially when you’re doing a visioning workshop with a large group of stakeholders, it’s important to listen to the different viewpoints but not making weak compromises on the vision ‘just to keep everybody in the room happy’. Consider stages of market maturity – What stage is your target market in? 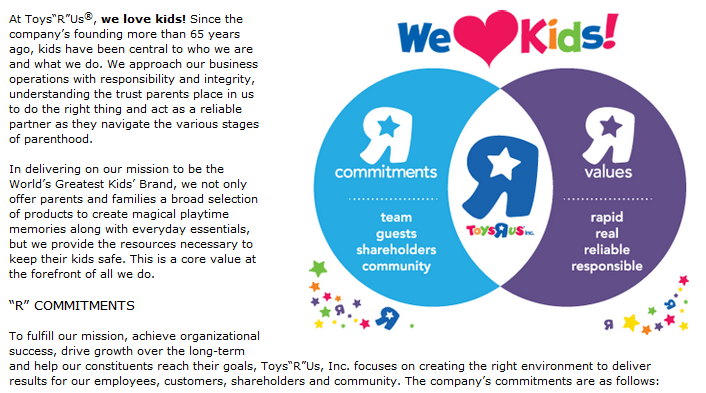 What is the competition like and what are their differentiators? What are the needs of your market segment? Product portfolio planning – Add an extra layer to your product roadmap to outline dependencies between products, specific “portfolio goals” and to highlight where products fit within your portfolio. Roman suggested using the BCG Matrix to qualify products within the portfolio: “stars”, “cash cows”, “question marks” and “dogs”. Product release planning – Add another layer to your product roadmap to indicate budget/costs per product release or milestone. 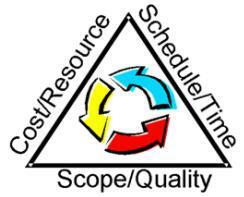 This helps in assessing the so-called “project management triangle” per individual release (see Fig. 5 below). You can then link a backlog with features specific to each milestone on the roadmap.